Can the Germans bring home gold? 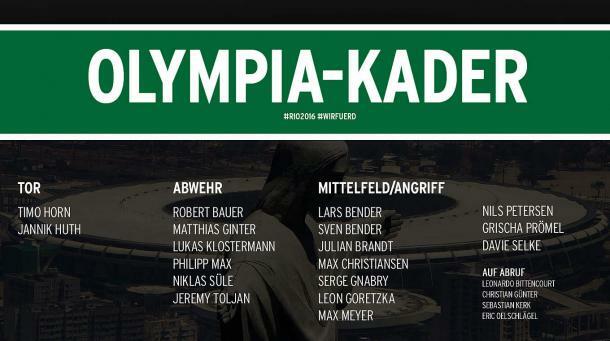 On Friday morning, Horst Hrubesch named his 18-man squad for the upcoming Men's Football tournament at the 2016 Olympic Games. This is the first time Germany have qualified as a reunified nation, with their last appearance at the finals coming in Seoul at the 1988 Games. The squad will be hoping to at least match the Bronze medal achieved by Johannes Löhr's side, which contained the likes of Jürgen Klinsmann and Karl-Heinz Riedle. Given the busy summer of football, Hrubesch has been fairly limited to what players he could select. No-one involved in a transfer, the World Cup or UEFA Champions League and UEFA Europa League qualifiers was made available for nomination into the team. Lars and Sven Bender are the two stand-out names in the squad, although it is still packed with exciting talents even after the 'rules' have been applied. Nils Petersen takes up the other place as an over-age player, while World Cup winner and Borussia Dortmund defender, Matthias Ginter has also made the cut. 1. FC Köln, BVB, FC Ingolstadt 04, Bayer Leverkusen, TSG 1899 Hoffenheim, Schalke 04 and RB Leipzig all have two players in the 18. The head coach said, "The anticipation of the Olympics is huge. The aim of reaching Rio has been with me for a long time. "This is for us a unique experience that the player in the team can tell their grandchildren, we have a good mix between the current U-21 National team and older players." 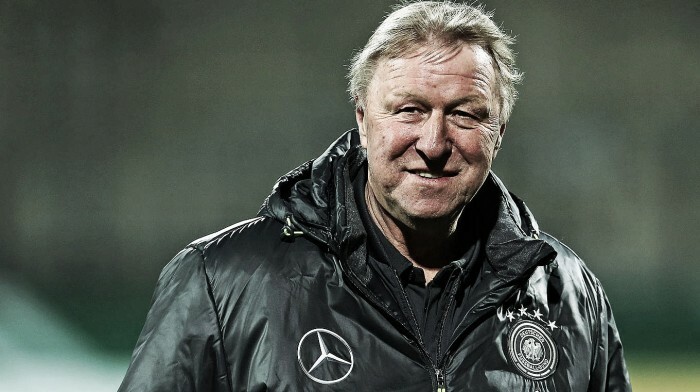 Hrubesch explained, "The quality of the team is, despite the difficult selection, absolutely great. I look forward to it and am sure that with these guys a lot is possible." He concluded, "We go to Brazil to win every game. Anything else does not make sense." Goalkeepers: Timo Horn (1. FC Köln), Jannik Huth (1. FSV Mainz 05). Defenders: Robert Bauer (FC Ingolstadt 04), Matthias Ginter (Borussia Dortmund), Lukas Klostermann (RB Leipzig), Philipp Max (FC Augsburg), Niklas Süle, Jeremy Toljan (TSG 1899 Hoffenheim). Midfielders: Lars Bender (Bayer Leverkusen), Sven Bender (Borussia Dortmund), Max Christiansen (FC Ingolstadt 04), Leon Goretkza, Max Meyer (both Schalke 04), Grischa Prömel (Karlsuher SC). Forwards: Julian Brandt (Bayer Leverkusen), Serge Gnabry (Arsenal), Nils Petersen (SC Freiburg), Davie Selke (RB Leipzig). Reserves: Eric Oelschlägel (Werder Bremen), Christian Günter (SC Freiburg), Leonardo Bittencourt (1. FC Köln), Sebastian Kerk (SC Freiburg).